Newest smartphone technology has given us the ability to have the world at our fingertips. With HD display and powerful cameras, iPhone has given a platform for artists to connect with one another through their passions. Digital art has become a huge trend and provides the ability for artists to take what they love on the go. Feeling inspired while outside of the studio? Wanting to capture a moment on vacation but don’t have the tools to do so? Bring your creativity to life through these apps… and then back to your studio! Tayasui is a drawing & painting app with a long list of tools and features for any digital artist. Some of these tools include felt pen, oil pastel, watercolor, and acrylic brushes. This app is also compatible with the iPad for those who prefer a different platform. A pro version of the app sells for $5.99 and includes even more tools and add-ons. With over 25 million users, “Paper by FiftyThree” is one of the worlds largest sketching apps and it has helped many find their own creative space within the app. Auto-correction makes it easy to draw clean straight lines while at the same time giving the artist freedom. Great for on the go art and provides a simple user interface! If you want an upgrade from the free version, PaperPro goes for 6.99 for 6 months. The Sketch Club App lets you draw and paint while sharing what you create with a whole community within the app. Bringing artistic and creative people together all over the world, the Sketch Club App is great for those wanting a more social drawing and painting experience. Adobe Photoshop Sketch gives users the ability to choose from over 24 brushes, this app is essentially Photoshops brush feature in app form. This app also lets users share their drawing process with an automated time-lapse video feature. Did you know that more than 10 million children in the US each year choose to have a birthday party at their local bowling center? This makes the industry the top party destination for kids aged 12 and younger. Even in 2018, there is huge potential for the Bowling Industry to achieve profitability. In order to do this, however, Centers must adapt to emerging trends and appeal to multiple generations. Take a Look at the Top Bowling Center Trends of 2018 & Some Tips on How to Grow Your Center! These days, bowling alleys must consider combining other activities such as game rooms, Virtual Reality, or Laser Tag into their business model. These activities will encourage customers to stick around longer and increase revenue, as well as customer engagement! Implementing additional activities on top of bowling has been boosting revenues for centers all across the country. Throughout the history of bowling, league play has contributed a huge amount to the success of the industry. While League play is still key in order to be successful, younger generations, whom you should be tailoring your bowling alleys to, enjoy more social outings when visiting. Bowling Centers must adjust to this and create a product that appeals to younger customers as well as older generations. Up to date technology is almost a necessity in order to keep your bowling center profitable. There are a number of ways to keep up with technological trends of the industry. Here are some many centers have adapted. Auto Scoring Systems – Modern auto scoring speeds up the pace of play and allows for customers to not worry about anything besides enjoying your alley. Debit/Credit Card system – Cash only is a thing of the past and all bowling centers should adapt technology in order to accept multiple forms of payment. Online Booking – Put the power in the hands of your customers and allow them to book parties and lanes online before leaving the house. This will save customers time and make it easier for employee’s at your center as well. PlaceFull is a great place to start! Sign up for a free demo today! Our latest feature release is here. We are excited to help you get all you can out of PlaceFull – check out the NEW and awesome additions we have in store for you below! The NEW printable booking details feature gives merchants the ability to have all the important information of their next booking in their hands. Basic information like; date of the booking, name of the person who booked, and how many people are scheduled to be at the booking are all in your grasp, not your computer screen. Does your business ask extra questions to further enhance the experience of a party or event at the time of booking? If that is the case, all responses to questions and special requests, are printable. Or does your business offer add-ons to your listings? Add-ons and the amount ordered during the booking process are printable with this NEW feature, as well. With information easily accessible, merchants will be able to cater to the needs of individuals easier. The NEW repeating notes are here to save you time. Merchants can now add notes to the same days every week. Adding a start date and an end date will allow you to extend those notes for as long as you like. Merchants can offer buy one get one half off deals every Tuesday and Thursday with no hassle to remember to extend that on your calendar. Special events or deals that happen every week will be easier to add, edit, and delete. Set it and forget it. This NEW list-view description feature allows potential customers to read about your available classes or event before ever clicking on the listing. Merchants can give a small detail, or a tag line to hook customers looking at their listings. This feature offers an opportunity to catch the eye of everyone looking at your booking list! Any questions about the new features? Feel free to give us a call at (206)624-0295 with any comments or concerns, we’d love to help you out as always! Categories: Booking Trends, Bowling Centers, Feature Updates, Marketing Tips, Marketplace, Merchant "How To's", Merchant News, PlaceFull News, Software, Uncategorized | Tags: Feature Release, Feature Updates, online booking, online booking software, online reservations, online scheduling, placefull features, placefull news | Permalink. Now Announcing – PlaceFull and Color Me Mine have officially partnered! As a leader in the online booking space, PlaceFull is thrilled to provide the Color Me Mine franchise with the solution they’ve been searching for. Franchiee owners nation wide can expect to save more time and money with PlaceFull by their side. Ultimately, the new partnership presents many exciting opportunities for both companies to grow and reach new heights. Check out the news story here to get the full scoop! Categories: Booking Trends, Color Me Mine, Glassblowing, Marketplace, Merchant News, PlaceFull News, PYOP Studios, Software, Uncategorized | Tags: art studios, ceramic studios, Color Me Mine, franchise, news, online booking, online reservation software, online scheduling, partners, partnership, PlaceFull, placefull news | Permalink. The journey started just 3 years ago when the former Girl Scout Troop leaders, Katie Summerford and Vicki Burgess, got wind that their local Color Me Mine ceramics studio was up for sale. Before they knew it, Katie and Vicki went from crafting with girl scout troops, to crafting a business. With their new business in the works, Katie and Vicki started to assess what they liked about the existing business model, and what they wanted to change. 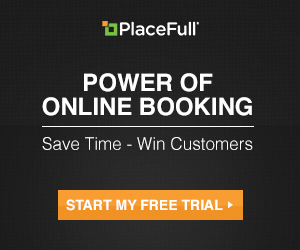 This lead to the realization that they were in need of a new online booking solution. While attending the annual CCSA (Contemporary Ceramic Studios Association) convention, Katie and Vicki discovered PlaceFull. The two business owners were drawn to the PlaceFull booth by smiling faces, and decided to stop and see what PlaceFull was all about. After running through a brief demo at the booth, it became clear that PlaceFull was the booking solution they had been looking for. While their former booking system could only manage parties, PlaceFull would allow them to offer classes, workshops, and other private events online. Before PlaceFull, the studio had struggled with filling up their classes. After implementing PlaceFull, Katie and Vicki are able to promote ALL of their events and have sold out of multiple classes – finding themselves busier than ever with a dramatic increase in revenue! Instead of spending time promoting their events, Katie and Vicki can now put more time and energy into the flock of customers that walk through their doors. For owner Katie, one thing that really made the transition to PlaceFull painless was the customer support she received along the way from the PlaceFull support team. There are many resources available to PlaceFull merchants such as the PlaceFull Support page or the PlaceFull Members Facebook page to make getting help easy! She was pleasantly surprised when she reached out for assistance and immediately got the help she needed. The simplicity of PlaceFull was a breath of fresh air for the two studio owners. Since switching to PlaceFull, Katie and Vicki love how easy it is to navigate their account and set up events. Today, Katie finds herself creating events online in a matter of minutes and managing her booking calendar with ease. You can find Katie and Vicki’s Color Me Mine studio nestled away in beautiful Cypress, Texas. The studio is centered around ceramics and they have recently started experimenting with board art classes! With their out of the box thinking, Katie and Vicki even found a way to cut the cost of classes for their customers by taking the extra time to buy wood from Home Depot and cut the wood themselves. If you’re in the Cypress area, be sure to visit or book an event with Color Me Mine – Katie and Vicki would love to have you! Categories: Booking Trends, Case Studies, Color Me Mine, Marketing Tips, Marketplace, Merchant News, Merchant of the Month, PlaceFull News, PYOP Studios, Software, Uncategorized | Tags: Color Me Mine, merchant of the month, online booking, online reservations, online scheduling | Permalink. Throwback Thursday: The Best 3 Ways to Get a Hold of the PlaceFull Team! Can you believe we’re already stumbling upon the last Thursday of 2016?! To get everyone on the same page for the new year, we thought we’d dedicate our last Throwback Thursday of 2016 to The 3 Best Ways to Get in Touch with Us! It is our top priority to be there for our merchants when they need us, so we complied a list of a few ways to connect with us! Our new PlaceFull Members Club Facebook page is at the top of our list! This exclusive page is for PlaceFull merchants only and is a great resource for when you want to ask a simple question or start a conversation with fellow PlaceFull members. The PlaceFull support page is also a great place to find the answer to your question! We recently revamped our support site to include a ton of new step-by-step articles that explain how to manage your PlaceFull account – behind the scenes and on your website. If you prefer to give us a ring or to send over a quick email – we encourage us to do so. We love hearing directly from out merchants and want to make contacting us as convenient as possible!